Includes BHB Salts, MCT powder, Dairy and Stevia. INGREDIENTS: Beta Hydroxybutyrate, MCT Powder, Nonfat Dry Milk, Natural Flavour, Malic Acid, Stevia, Ascorbic Acid, Vitamin A, Vitamin B12, Riboflavine, Iodine, Magnesium. Contains Dairy. What kind of diet should I follow when I’m taking Keto OS Orange Dream ? 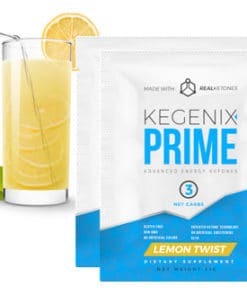 The wonderful thing about taking exogenous ketones via Pruvit Keto OS Orange Dream Exogenous Ketones is that you can experience the benefits of ketones without diet modification. Even those who don’t change a thing, will still experience the benefits. However, it is encouraged that you slowly begin to follow a lower carbohydrate diet, and enhance your body’s ability to utilize. What’s the difference between taking Keto OS Orange Dream and taking raspberry ketones?